Granulomatosis with polyangiitis (GPA), formerly known as Wegener granulomatosis, is a rare multisystem autoimmune disease of unknown etiology. Its hallmark features include necrotizing granulomatous inflammation and pauci-immune vasculitis in small- and medium-sized blood vessels. See the image below. Necrotic, purpuric, and blistering plaque on the wrist in a patient with granulomatosis with polyangiitis. 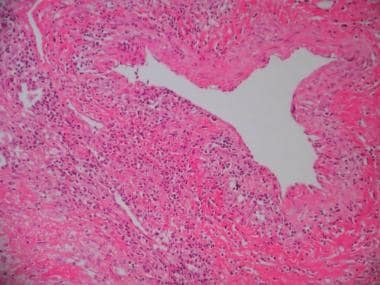 See Vasculitis: Case Presentations, a Critical Images slideshow, for more information on clinical, histologic, and radiographic imaging findings in various forms of vasculitis. Lung biopsy specimen from a patient with granulomatosis with polyangiitis showing evidence of vasculitis and inflammation (high-power view). Image courtesy of Z. Xu, MD. In 1936, Dr. Frederich Wegener reported three patients with similar clinical features and published his findings on their distinct clinical and histopathologic findings, leading to the eponymous designation of the disease. Before the institution of effective therapy, the mean survival of adults with untreated GPA was only 5 months, with 82% of patients dying within the first year and 90% of patients dying within the second year. Despite improvement with the use of corticosteroids, the mean survival time was increased only to 12.5 months. GPA is one of the ANCA-associated vasculitides (AAVs) and has a predilection for the upper and lower respiratory tracts and the kidneys. It has a spectrum of clinical presentations and may be divided broadly into limited or severe disease. Individuals with limited GPA present with clinical findings largely isolated to the upper and lower respiratory tracts and are generally not considered to have organ- or life-threatening disease. Persons with severe disease present with significant multisystem manifestations that may involve the lungs, kidneys, and other organs, in addition to the respiratory tract. Severe disease can also be described as generalized disease. Consensus does not exist as to whether limited GPA represents early severe disease or an altogether separate clinical entity. The terminology, limited versus severe, can sometimes be problematic because pulmonary and/or renal involvement may be absent at the onset of symptoms. Longitudinal follow-up of the National Institutes of Health GPA cohort (158 patients who were observed for 6 mo to 24 y) demonstrated that 18% of patients initially had renal disease and that 77% had glomerulonephritis upon later analysis. Thus, patients initially diagnosed with limited GPA may subsequently develop generalized disease with renal involvement. Below is an outline of the differences between limited and severe GPA based on the WGET trial manual of operations. Patients with GPA and their families must be educated on the serious nature of this disease. Potential risks and adverse effects of immunosuppressive medications should be detailed. Patient education information is available from the American College of Rheumatology and the Vasculitis Foundation. The pathologic hallmarks of GPA are vasculitis of the small- to medium-sized vessels, "geographic" necrosis, and granulomatous inflammation, particularly in the airways. The initial pathologic lesion is that of the granuloma believed to be caused by cellular immune processes. Environmental exposures, including respiratory tract infections, have been implicated as inciting factors for granuloma formation. A better understanding of the progression from granuloma to vasculitis may shed light on the possible etiology and pathogenesis of GPA. It is probable that a complex interaction exists between the environment and host factors, many of which are genetically determined. Cellular immune processes are also involved in tissue injury owing to the inflammatory cascade. The discovery of ANCAs within neutrophils in the majority of patients with GPA suggested the role of humoral autoimmunity. GPA is usually associated with the presence of diffuse staining cytoplasmic ANCA (C-ANCA) directed against serine proteinase 3 antigen (PR3-ANCA), the so-called Wegener autoantigen. The other AAVs include microscopic polyangiitis, renal-limited vasculitis, and Churg-Strauss syndrome (allergic granulomatous angiitis), which are more commonly associated with perinuclear-staining ANCA (P-ANCA) directed against myeloperoxidase (MPO-ANCA). In vivo experimental studies have demonstrated a pathogenic role for MPO-ANCA in mice and rat models. MPO-ANCA induces a pauci-immune necrotizing glomerulonephritis and hemorrhagic capillaritis in these animal models. Neutrophils, as well as the complement system, are necessary for lesion development. Despite this in vivo evidence for a pathogenic role of MPO-ANCA in AAV-like syndromes in animal models, no definitive in vivo evidence has yet been found for PR3-ANCA. Further research is necessary to further elaborate its role in GPA. Exhibiting certain forms of the Fcγ receptor IIIb on the surface of neutrophils and monocytes/macrophages. Living in northern latitudes, farming, drug and environmental allergies, and exposures to solvents or silica have all been linked to the development of GPA. [24, 30] Reports vary as to whether disease onset is associated with a seasonal peak. GPA is a rare disease with an as yet undetermined incidence. The prevalence of GPA in the United States is estimated to be 3 cases per 100,000 people. The incidence and prevalence of GPA in the United Kingdom is estimated at 10.2 cases and 250 cases per million population, respectively. GPA is more common in individuals of northern European descent (approximately 90%); it occurs less commonly in blacks. Rising PR3-ANCA (C-ANCA) titers may correlate with disease activity in approximately two-thirds of patients. However, the relationship is unreliable; thus, negative PR3-ANCA results do not necessarily exclude the possibility of relapse. As significant adverse effects are associated with immunosuppressive therapy, especially cyclophosphamide, ANCA persistence or reappearance should be used as a warning signal rather than an indication to escalate therapy. Poorer survival is associated with older age, target organ involvement, and target organ damage. Renal involvement has been consistently shown to confer a poorer prognosis. An absence of renal involvement is associated with a 100% 5-year survival rate, compared with approximately 70% in individuals with renal disease. An increased risk of cardiovascular events is also noted. Overall, the 10-year survival rate ranges from 75-88%. Most morbidity in GPA is currently treatment related. Respiratory problems may result from upper-airway obstruction (eg, subglottic stenosis) or pulmonary involvement (eg, pleural effusion, dyspnea, diffuse alveolar hemorrhage [DAH]). Furthermore, the development of other cancers associated with immunosuppression in patients with AAV is a concern, as it is for patients with other inflammatory rheumatologic and nonrheumatologic diseases and for patients who have undergone organ transplantation. Increased rates of leukemia, lymphoma, and nonmelanoma skin cancers have been reported in a number of studies of treated patients with AAV. The observed overall incidence of cancers in this population is 1.6-2.4 times higher than in the general population. Clinicians caring for these patients should keep this increased risk in mind and refer and/or screen appropriately. Severe, untreated GPA is associated with a very high (>90%) mortality rate. Historically, patients with untreated GPA had a mean survival of 5 months from diagnosis; the mortality rate was 82% at 1 year. The introduction of corticosteroids prolonged the median survival by only 7.5 months. Fauci AS, Haynes BS, Katz P, Wolff SM. Wegener's granulomatosis: prospective clinical and therapeutic experience with 85 patients for 21 years. Ann Intern Med. January 1983. 98(1):76-85. [Medline]. Manganelli P, Fietta P, Carotti M, Pesci A, Salaffi F. Respiratory system involvement in systemic vasculitis. Clin Exp Rheumatol. March-April 2006. 24:S48-S59. [Medline]. Hoffman GS, Kerr GS, Leavitt RY, et al. Wegener granulomatosis: an analysis of 158 patients. Ann Intern Med. 1992 Mar 15. 116(6):488-98. [Medline]. Mukhtyar C, Guillevin L, Cid MC, et al. EULAR recommendations for the management of primary small and medium vessel vasculitis. Ann Rheum Dis. March 2009. 68:310-317. [Medline]. Jayne D, Rasmussen N, Andrassey K, et al. A randomized trial of maintenance therapy for vasculitis associated with antineutrophil cytoplasmic antibodies. N Engl J Med. July 2003. 349(1):36-44. [Medline]. Metzler C, Miehle N, Manger K, et al. Elevated relapse rate under oral methotrexate versus leflunomide for maintenance of remission in Wegener's granulomatosis. Rheumatology (Oxford). July 2007. 46(7):1087-1091. [Medline]. Falk RJ, Gross WL, Guillevin L, et al. Granulomatosis with polyangiitis (Wegener’s): an alternative name for Wegener’s granulomatosis. Ann Rheum Dis. 2011. 70:704. [Medline]. Leavitt RY, Fauci AS, Bloch DA, et al. The American College of Rheumatology 1990 criteria for the classification of Wegener's granulomatosis. Arthritis Rheum. August 1990. 33(8):1101-1107. [Medline]. Wegener's Granulomatosis Etanercept Trial (WGET) Research Group. Limited versus severe Wegener's granulomatosis: baseline patient data on patients in the Wegener's granulomatosis etanercept trial. Arthritis Rheum. August 2003. 48(8):2299-2309. [Medline]. Finkielman JD, Lee AS, Hummel AM, et al. ANCA are detectable in nearly all patients with active severe Wegener's Granulomatosis. Am J Med. July 2007. 120:643.e9-14. [Medline]. Boomsma MM, Stegeman CA, van der Leij MJ, et al. Prediction of relapses in Wegener's granulomatosis by measurement of antineutrophil cytoplasmic antibody levels: a prospective study. Arthritis Rheum. September 2000. 43(9):2025-33. [Medline]. Finkielman JD, Merkel PA, Schroeder D, et al. Antiproteinase 3 antineutrophil cytoplasmic antibodies and disease activity in Wegener granulomatosis. Ann Intern Med. November 2007. 147(9):611-9. [Medline]. Wegener's Granulomatosis Etanercept Trial (WGET) Research Group. Etanercept plus standard therapy for Wegener's Granulomatosis. N Engl J Med. 2005 Jan 27. 352(4):351-61. [Medline]. Schlieben DJ, Korbet SM, Kimura RE, Schwartz MM, Lewis EJ. Pulmonary-renal syndrome in a newborn with placental transmission of ANCAs. Am J Kidney Dis. 2005 Apr. 45(4):758-61. [Medline]. Stegeman CA, Tervaert JW, Sluiter WJ, Manson WL, de Jong PE, Kallenberg CG. Association of chronic nasal carriage of Staphylococcus aureus and higher relapse rates in Wegener granulomatosis. Ann Intern Med. January 1994. 120(1):12-17. [Medline]. Stone JH, Merkel PA, Spiera R, Seo P, Langford CA, Hoffman GS, et al. Rituximab versus cyclophosphamide for ANCA-associated vasculitis. N Engl J Med. 2010 Jul 15. 363(3):221-32. [Medline]. Jones RB, Tervaert JW, Hauser T, et al. Rituximab versus cyclophosphamide in ANCA-associated renal vasculitis. N Engl J Med. July 2010. 363(3):211-20. [Medline]. Kallenberg CGM. Pathogenesis of PR3-ANCA associated vasculitis. J Autoimmun. February-March 2008. 30:29-36. [Medline]. Falk RJ, Terrell RS, Charles LA, Jennett C. Anti-neutrophil cytoplasmic autoantibodies induce neutrophils todegranulate and produce oxygen radicals in vitro. Proc Natl Acad Sci USA. June 1990. 87:4115-4119. Kallenberg CGM. Pathophysiology of ANCA-associated small vessel vasculitis. Curr Rheumatol Rep. December 2010. 12(6):399-405. [Medline]. Xiao H, Heeringa P, Liu Z, et al. The role of neutrophils in the induction of glomerulonephritis by anti-myeloperoxidase antibodies. Am J Pathol. July 2005. 167(1):39-45. [Medline]. Kallenberg CGM, Heeringa P, Stegeman CA. Mechanisms of disease: pathogenesis and treatment of ANCA-associated vasculitis. Nat Clin Pract Rheumatol. December 2006. 2:661-670. [Medline]. Moosig F, Lamprecht P, Gross WL. Wegener's Granulomatosis: the current view. Clin Rev Allergy Immunol. October 2008. 35(1-2):19-21. [Medline]. Spagnolo P, Richeldi L, DuBois RM. Environmental triggers and susceptibility factors in idiopathic granulomatous diseases. Semin Respir Crit Care Med. December 2008. 29:610-619. [Medline]. Carr EJ, Niederer HA, Williams J, et al. Confirmation of the genetic association of CTLA4 and PTPN22 with ANCA-associated vasculitis. BMC Med Genet. December 2009. 10:121. [Medline]. Jagiello P, Aries P, Arning L, et al. The PTPN22 620W allele is a risk factor for Wegener's granulomatosis. Arthritis Rheum. December 2005. 52(12):4039-43. [Medline]. Heckmann M, Holle JU, Arning L, et al. The Wegener's granulomatosis quantitative trait locus on chromosome 6p21.3 as characterised by tagSNP genotyping. Ann Rheum Dis. July 2008. 67(7):972-9. [Medline]. Pendergraft WF 3rd, Preston GA, Shah RR, et al. Autoimmunity is triggered by cPR-3(105-201), a protein complementary to human autoantigen proteinase-3. Nat Med. January 2004. 10(1):72-9. [Medline]. Kain R, Exner M, Brandes R, et al. Molecular mimicry in pauci-immune focal necrotizing glomerulonephritis. Nat Med. October 2008. 14(10):1088-96. [Medline]. Hogan SL, Cooper GS, Savitz DA, et al. Association of silica exposure with anti-neutrophil cytoplasmic autoantibody small-vessel vasculitis: a population-based, case-control study. Clin J Am Soc Nephrol. March 2007. 2(2):290-9. [Medline]. Watts RA, Lane SE, Koldingsnes W, et al. Epidemiology of vasculitis in Europe. Ann Rheum Dis. December 2001. 60(12):1156-7. [Medline]. Lane SE, Watts R, Scott DGI. Epidemiology of systemic vasculitis. Curr Rheumatol Rep. August 2005. 7:270-275. [Medline]. Iudici M, Quartier P, Terrier B, Mouthon L, Guillevin L, Puéchal X. Childhood-onset granulomatosis with polyangiitis and microscopic polyangiitis: systematic review and meta-analysis. Orphanet J Rare Dis. 2016 Oct 22. 11 (1):141. [Medline]. [Full Text]. Mukhtyar C, Flossmann O, Hellmich B, et al. Outcomes from studies of antineutrophil cytoplasm antibody associated vasculitis: a systematic review by the European League Against Rheumatism systemic vasculitis task force. Ann Rheum Dis. July 2008. 67:1004-1010. [Medline]. Haroun MK, Stone JH, Nair R, Racusen L, Hellmann DB, Eustace JA. Correlation of percentage of normal glomeruli with renal outcome in Wegener's granulomatosis. Am J Nephrol. September-December 2002. 22(5-6):497-503. [Medline]. Hauer HA, Bajema IM, Van Houwelingen HC, et al. Determinants of outcome in ANCA-associated glomerulonephritis: a prospective clinico-histopathological analysis of 96 patients. Kidney Int. November 2002. 62(5):1732-1742. [Medline]. Renaudineau Y, Le Meur Y. Renal involvement in Wegener's Granulomatosis. Clinic Rev Allerg Immunol. October 2008. 35:22-29. [Medline]. Walsh M, Merkel PA, Mahr A, Jayne D. Effects of duration of glucocorticoid therapy on relapse rate in antineutrophil cytoplasmic antibody-associated vasculitis: A meta-analysis. Arthritis Care Res (Hoboken). 2010 Aug. 62(8):1166-73. [Medline]. Phillip R, Luqmani R. Mortality in systemic vasculitis: a systematic review. Clin Exp Rheumatol. September-October 2008. 26:S94-S104. [Medline]. Seo P, Min Y-I, Holbrook JT, et al. Damage caused by Wegener's Granulomatosis and its treatment: prospective data from the Wegener's Granulomatosis Etanercept Trial (WGET). Arthritis Rheum. July 2005. 52:2168-2178. [Medline]. Le Guenno G, Mahr A, Pagnoux C, Dhote R, Guillevin L. Incidence and predictors of urotoxic adverse events in cyclophosphamide-treated patients with systemic necrotizing vasculitides. Arthritis Rheum. 2011 Feb 17. [Medline]. Heijl C, Harper L, Flossmann O, et al. Incidence of malignancy in patients treated for antineutrophil cytoplasm antibody-associated vasculitis: follow-up data from European Vasculitis Study Group clinical trials. Ann Rheum Dis. August 2011. 70(8):1415-1421. [Medline]. Suppiah R, Judge A, Batra R, et al. A model to predict cardiovascular events in patients with newly diagnosed wegener's granulomatosis and microscopic polyangiitis. Arthritis Care Res (Hoboken). 2011 Jan 14. [Medline]. Aviña-Zubieta JA, Mai A, Amiri N, Dehghan N, Ann Tan J, Sayre EC, et al. Risk of Myocardial Infarction and Stroke in Patients With Granulomatosis With Polyangiitis (Wegener's): A Population-Based Study. Arthritis Rheumatol. 2016 Nov. 68 (11):2752-2759. [Medline]. Little MA, Nightingale P, Verburgh CA, et al. Early mortality in systemic vasculitis: relative contribution of adverse events and active vasculitis. Ann Rheum Dis. June 2010. 69(6):1036-43. [Medline]. Wallace ZS, Lu N, Miloslavsky E, Unizony S, Stone JH, Choi HK. Nationwide Trends in Hospitalizations and In-Hospital Mortality of Granulomatosis with Polyangiitis. Arthritis Care Res (Hoboken). 2016 Jul 7. [Medline]. Holle JU, Gross WL. Neurological involvement in Wegener's granulomatosis. Curr Opin Rheumatol. 2011 Jan. 23(1):7-11. [Medline]. Florian A, Slavich M, Blockmans D, Dymarkowski S, Bogaert J. Cardiac involvement in granulomatosis with polyangiitis (Wegener granulomatosis). Circulation. 2011 Sep 27. 124 (13):e342-4. [Medline]. McGeoch L, Carette S, Cuthbertson D, Hoffman GS, Khalidi N, Koening CL, et al. Cardiac Involvement in Granulomatosis with Polyangiitis. J Rheumatol. 2015 Jul. 42 (7):1209-12. [Medline]. Hazebroek MR, Kemna MJ, Schalla S, Sanders-van Wijk S, Gerretsen SC, Dennert R, et al. Prevalence and prognostic relevance of cardiac involvement in ANCA-associated vasculitis: Eosinophilic granulomatosis with polyangiitis and granulomatosis with polyangiitis. Int J Cardiol. 2015 Nov 15. 199:170-9. [Medline]. Al-Hakeem DA, Fedele S, Carlos R, Porter S. Extranodal NK/T-cell lymphoma, nasal type. Oral Oncol. January 2007. 43(1):4-14. [Medline]. Frankel SK, Cosgrove GP, Fischer A. Update in the diagnosis and management of pulmonary vasculitis. Chest. February 2006. 129(2):452-65. [Medline]. Bossuyt X, Cohen Tervaert JW, Arimura Y, et al. Position paper: Revised 2017 international consensus on testing of ANCAs in granulomatosis with polyangiitis and microscopic polyangiitis. Nat Rev Rheumatol. 2017 Nov. 13 (11):683-692. [Medline]. Rottem M, Fauci AS, Hallahan CW, Kerr GS, Lebovics R, Leavitt RY, et al. Wegener granulomatosis in children and adolescents: clinical presentation and outcome. J Pediatr. 1993 Jan. 122(1):26-31. [Medline]. Polychronopoulos VS, Prakash UBS, Golbin JM, Edell ES, Specks U. Airway involvement in Wegener's Granulomatosis. Rheum Dis Clin N Am. November 2007. 33:755-775. [Medline]. Hervier B, Durant C, Masseau A, Ponge T, Hamidou M, Mussini JM. Use of muscle biopsies for diagnosis of systemic vasculitides. J Rheumatol. 2011 Mar. 38(3):470-4. [Medline]. Nunokawa T, Yokogawa N, Shimada K, Enatsu K, Sugii S. The use of muscle biopsy in the diagnosis of systemic vasculitis affecting small to medium-sized vessels: a prospective evaluation in Japan. Scand J Rheumatol. 2015 Oct 8. 1-5. [Medline]. DeGroot K, Harper L, Jayne DRW, et al. Pulse versus daily oral cyclophosphamide for induction of remission in antineutrophil cytoplasmic antibody-associated vasculitis: a randomized trial. Ann Intern Med. May 2009. 150:670-680. [Medline]. Monach PA, Arnold LM, Merkel PA. Incidence and prevention of bladder toxicity from cyclophosphamide in the treatment of rheumatic diseases: a data-driven review. Arthritis Rheum. 2010 Jan. 62(1):9-21. [Medline]. Clowse ME, Copland SC, Hsieh TC, Chow SC, Hoffman GS, Merkel PA, et al. Ovarian reserve diminished by oral cyclophosphamide therapy for granulomatosis with polyangiitis (Wegener's). Arthritis Care Res (Hoboken). 2011 Dec. 63(12):1777-81. [Medline]. Langford CA. Cyclophosphamide as induction therapy for Wegener's granulomatosis and microscopic polyangiitis. Clin Exp Immunol. May 2011. 164 (Suppl 1):31-4. [Medline]. Specks U, Merkel PA, Seo P, Spiera R, Langford CA, Hoffman GS, et al. Efficacy of remission-induction regimens for ANCA-associated vasculitis. N Engl J Med. 2013 Aug 1. 369(5):417-27. [Medline]. Garcia-Valladares I, Espinoza LR. Is rituximab superior to cyclophosphamide for ANCA-associated vasculitis for induction of remission, and with a better safety profile?. Curr Rheumatol Rep. December 2010. 12(6):395-8. [Medline]. Aries PM, Hellmich B, Voswinkel J, et al. Lack of efficacy of rituximab in Wegener's granulomatosis with refractory granulomatous manifestations. Ann Rheum Dis. July 2006. 65(7):853-858. [Medline]. Seo P, Specks U, Keogh KA. Efficacy of rituximab in limited Wegener's granulomatosis with refractory granulomatous manifestations. J Rheumatol. October 2008. 35(10):2017-2023. [Medline]. Gottenberg JE, Ravaud P, Bardin T, et al. Risk factors for severe infections in patients with rheumatoid arthritis treated with rituximab in the autoimmunity and rituximab registry. Arthritis Rheum. 2010 Sep. 62(9):2625-32. [Medline]. Jones RB, Ferraro AJ, Chaudhry AN, et al. A multicenter survey of rituximab therapy for refractory antineutrophil cytoplasmic antibody-associated vasculitis. Arthritis Rheum. 2009 Jul. 60(7):2156-68. [Medline]. Tesfa D, Ajeganova S, Hägglund H, et al. Late-onset neutropenia following rituximab therapy in rheumatic diseases: Association with B lymphocyte depletion and infections. Arthritis Rheum. August 2011. 63(8):2209-2214. [Medline]. McGregor JG, Hogan SL, Hu Y, Jennette CE, Falk RJ, Nachman PH. Glucocorticoids and relapse and infection rates in anti-neutrophil cytoplasmic antibody disease. Clin J Am Soc Nephrol. 2012 Feb. 7(2):240-7. [Medline]. [Full Text]. Klemmer PJ, Chalermskulrat W, Reif MS, Hogan SL, Henke DC, Falk RJ. Plasmapheresis therapy for diffuse alveolar hemorrhage in patients with small-vessel vasculitis. Am J Kidney Dis. December 2003. 42(6):1149-1153. [Medline]. Pusey CD, Rees AJ, Evans DJ, Peters DK, Lockwood CM. Plasma exchange in focal necrotizing glomerulonephritis without anti-GBM antibodies. Kidney Int. October 1991. 40(4):757-763. [Medline]. Jayne DR, Gaskin G, Rasmussen N, et al. Randomized trial of plasma exchange or high-dosage methylprednisolone as adjunctive therapy for severe renal vasculitis. J Am Soc Nephrol. July 2007. 18(7):2180-2188. [Medline]. Casian A, Jayne D. Plasma exchange in the treatment of Wegener's granulomatosis, microscopic polyangiitis, Churg-Strauss syndrome and renal limited vasculitis. Curr Opin Rheumatol. 2011 Jan. 23(1):12-7. [Medline]. DeGroot K, Rasmussen N, Bacon PA, et al. Randomized trial of cyclophosphamide versus methotrexate for induction of remission in early systemic antineutrophil cytoplasmic antibody-associated vasculitis. Arthritis Rheum. August 2005. 52:2461-2469. [Medline]. Rhee EP, Laliberte KA, Niles JL. Rituximab as maintenance therapy for anti-neutrophil cytoplasmic antibody-associated vasculitis. Clin J Am Soc Nephrol. 2010 Aug. 5(8):1394-400. [Medline]. [Full Text]. Sanders JS, Slot MC, Stegeman CA. Maintenance therapy for vasculitis associated with antineutrophil cytoplasmic autoantibodies. N Engl J Med. November 2003. 349(21):2072-2073. [Medline]. Slot MC, Tervaert JW, Boomsma MM, Stegeman CA. Positive classic antineutrophil cytoplasmic antibody (C-ANCA) titer at switch to azathioprine therapy associated with relapse in proteinase 3-related vasculitis. Arthritis Rheum. April 2004. 51(2):269-273. [Medline]. Pagnoux C, Mahr A, Hamidou MA, et al. Azathioprine or methotrexate maintenance for ANCA-associated vasculitis. N Engl J Med. December 2008. 359:2790-2803. [Medline]. Puéchal X, Pagnoux C, Perrodeau É, Hamidou M, Boffa JJ, et al. Long-term outcomes of the WEGENT trial on remission-maintenance for granulomatosis with polyangiitis or microscopic polyangiitis. Arthritis Rheumatol. 2015 Oct 16. [Medline]. Reinhold-Keller E, Fink CO, Herlyn K, Gross WL, De Groot K. High rate of renal relapse in 71 patients with Wegener's granulomatosis under maintenance of remission with low-dose methotrexate. Arthritis Rheum. June 2002. 47(3):326-32. [Medline]. Langford CA, Talar-Williams C, Barron KS, Sneller MC. Use of a cyclophosphamide-induction methotrexate-maintenance regimen for the treatment of Wegener's granulomatosis: extended follow-up and rate of relapse. Am J Med. April 2003. 114(6):463-9. [Medline]. Langford CA, Talar-Williams C, Barron KS, Sneller MC. A staged approach to the treatment of Wegener's granulomatosis: induction of remission with glucocorticoids and daily cyclophosphamide switching to methotrexate for remission maintenance. Arthritis Rheum. December 1999. 42(12):2666-73. [Medline]. Sneller MC, Hoffman GS, Talar-Williams C, Kerr GS, Hallahan CW, Fauci AS. An analysis of forty-two Wegener's granulomatosis patients treated with methotrexate and prednisone. Arthritis Rheum. May 1995. 38(5):608-13. [Medline]. Guillevin L, et al; French Vasculitis Study Group. Rituximab versus azathioprine for maintenance in ANCA-associated vasculitis. N Engl J Med. 2014 Nov 6. 371 (19):1771-80. [Medline]. [Full Text]. Terrier B, et al; French Vasculitis Study Group. Long-term efficacy of remission-maintenance regimens for ANCA-associated vasculitides. Ann Rheum Dis. 2018 Aug. 77 (8):1150-1156. [Medline]. Charles P, et al; French Vasculitis Study Group. Comparison of individually tailored versus fixed-schedule rituximab regimen to maintain ANCA-associated vasculitis remission: results of a multicentre, randomised controlled, phase III trial (MAINRITSAN2). Ann Rheum Dis. 2018 Aug. 77 (8):1143-1149. [Medline]. Stegeman CA, Tervaert JW, de Jong PE, Kallenberg CG. Trimethoprim-sulfamethoxazole (co-trimoxazole) for the prevention of relapses of Wegener's granulomatosis. Dutch Co-Trimoxazole Wegener Study Group. N Engl J Med. 1996 Jul 4. 335(1):16-20. [Medline]. Bosch X, Guilabert A, Espinosa G, Mirapeix E. Treatment of antineutrophil cytoplasmic antibody-associated vasculitis: a systematic review. JAMA. August 2007. 298:655-669. [Medline]. Martinez V, Cohen P, Pagnoux C, et al. Intravenous immunoglobulins for relapses of systemic vasculitides associated with antineutrophil cytoplasmic autoantibodies: results of a multicenter, prospective, open-label study of twenty-two patients. Arthritis Rheum. January 2008. 58(1):308-371. [Medline]. Silva F, Specks U, Kalra S, et al. Mycophenolate mofetil for induction and maintenance of remission in microscopic polyangiitis with mild to moderate renal involvement--a prospective, open-label pilot trial. Clin J Am Soc Nephrol. March 2010. 5(3):445-53. [Medline]. Joy MS, Hogan SL, Jennette JC, Falk RJ, Nachman PH. A pilot study using mycophenolate mofetil in relapsing or resistant ANCA small vessel vasculitis. Nephrol Dial Transplant. December 2005. 20(12):2725-2732. [Medline]. Koukoulaki M, Jayne DR. Mycophenolate mofetil in anti-neutrophil cytoplasm antibodies-associated systemic vasculitis. Nephron Clin Pract. 2006. 102(3-4):c100-7. [Medline]. Nowack R, Göbel U, Klooker P, Hergesell O, Andrassy K, van der Woude FJ. Mycophenolate mofetil for maintenance therapy of Wegener's granulomatosis and microscopic polyangiitis: a pilot study in 11 patients with renal involvement. J Am Soc Nephrol. 1999 Sep. 10(9):1965-71. [Medline]. Hiemstra TF, Walsh M, Mahr A, et al. Mycophenolate mofetil vs azathioprine for remission maintenance in antineutrophil cytoplasmic antibody-associated vasculitis: a randomized controlled trial. JAMA. December 2010. 304(21):2381-2388. [Medline]. Stone JH, Uhlfelder ML, Hellmann DB, Crook S, Bedocs NM, Hoffman GS. Etanercept combined with conventional treatment in Wegener's granulomatosis: a six-month open-label trial to evaluate safety. Arthritis Rheum. May 2001. 44(5):1149-1154. [Medline]. Booth A, Harper L, Hammad T, Bacon P, Griffith M, Levy J, et al. Prospective study of TNFalpha blockade with infliximab in anti-neutrophil cytoplasmic antibody-associated systemic vasculitis. J Am Soc Nephrol. 2004 Mar. 15(3):717-21. [Medline]. Lee RW, D'Cruz DP. Novel therapies for anti-neutrophil cytoplasmic antibody-associated vasculitis. Drugs. 2008. 68:747-770. [Medline]. Sangle SR, Hughes GR, D'Cruz DP. Infliximab in patients with systemic vasculitis that is difficult to treat: poor outcome and significant adverse effects. Ann Rheum Dis. April 2007. 66(4):564-565. [Medline]. Hinze CH, Colbert RA. B-cell depletion in Wegener's Granulomatosis. Clin Rev Allergy Immunol. June 2008. 34:372-379. [Medline]. Schmitt WH, Birck R, Heinzel PA, et al. Prolonged treatment of refractory Wegener's granulomatosis with 15-deoxyspergualin: an open study in seven patients. Nephrol Dial Transplant. June 2005. 20(6):1083-1092. [Medline]. Birck R, Warnatz K, Lorenz HM, et al. 15-Deoxyspergualin in patients with refractory ANCA-associated systemic vasculitis: a six-month open-label trial to evaluate safety and efficacy. J Am Soc Nephrol. February 2003. 14(2):440-7. [Medline]. Schmitt WH, Hagen EC, Neumann I, et al. Treatment of refractory Wegener's granulomatosis with antithymocyte globulin (ATG): an open study in 15 patients. Kidney Int. April 2004. 65(4):1440-1448. [Medline]. Walsh M, Chaudhry A, Jayne D. Long-term follow-up of relapsing/refractory anti-neutrophil cytoplasm antibody associated vasculitis treated with the lymphocyte depleting antibody alemtuzumab (CAMPATH-1H). Ann Rheum Dis. September 2008. 67(9):1322-1327. [Medline]. Reynolds J, Tam FW, Chandraker A, et al. CD28-B7 blockade prevents the development of experimental autoimmune glomerulonephritis. J Clin Invest. March 2000. 105(5):643-51. [Medline]. Girard C, Charles P, Terrier B, Bussonne G, Cohen P, Pagnoux C, et al. Tracheobronchial Stenoses in Granulomatosis With Polyangiitis (Wegener's): A Report on 26 Cases. Medicine (Baltimore). 2015 Aug. 94 (32):e1088. [Medline]. Hoffman GS, Thomas-Golbanov CK, Chan J, Akst LM, Eliachar I. Treatment of subglottic stenosis, due to Wegener's granulomatosis, with intralesional corticosteroids and dilation. J Rheumatol. May 2003. 30(5):1017-21. [Medline]. Langford CA, Sneller MC, Hallahan CW, et al. 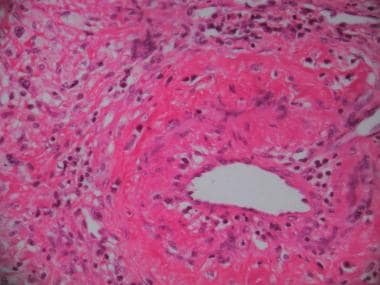 Clinical features and therapeutic management of subglottic stenosis in patients with Wegener's granulomatosis. Arthritis Rheum. October 1996. 39(10):1754-60. [Medline]. Martinez Del Pero M, Jayne D, Chaudhry A, Sivasothy P, Jani P. Long-term outcome of airway stenosis in granulomatosis with polyangiitis (Wegener granulomatosis): an observational study. JAMA Otolaryngol Head Neck Surg. 2014 Nov. 140 (11):1038-44. [Medline]. Ezzat WH, Compton RA, Basa KC, Levi J. Reconstructive Techniques for the Saddle Nose Deformity in Granulomatosis With Polyangiitis: A Systematic Review. JAMA Otolaryngol Head Neck Surg. 2017 May 1. 143 (5):507-512. [Medline]. Wallace ZS, Wallwork R, Zhang Y, Lu N, Cortazar F, Niles JL, et al. Improved survival with renal transplantation for end-stage renal disease due to granulomatosis with polyangiitis: data from the United States Renal Data System. Ann Rheum Dis. 2018 Sep. 77 (9):1333-1338. [Medline]. Esposito D, Trimpou P, Giugliano D, Dehlin M, Ragnarsson O. Pituitary dysfunction in granulomatosis with polyangiitis. Pituitary. 2017 Oct. 20 (5):594-601. [Medline]. [Full Text]. Peters JE, Gupta V, Saeed IT, Offiah C, Jawad ASM. Severe localised granulomatosis with polyangiitis (Wegener's granulomatosis) manifesting with extensive cranial nerve palsies and cranial diabetes insipidus: a case report and literature review. BMC Neurol. 2018 May 1. 18 (1):59. [Medline]. [Full Text]. Saddle nose deformity in a 26-year-old man with granulomatosis with polyangiitis. Image courtesy of P. Papadopoulos, MD. Several necrotic, purpuric, and blistering papules and plaques on the hands in a patient with granulomatosis with polyangiitis. Granulomatosis with polyangiitis (formerly known as Wegener granulomatosis). Large ulceration of the pharynx covered with a dense necrotic membrane. Extensive thickening of the maxillary sinuses in a patient with granulomatosis with polyangiitis. The patient also had intermittent epistaxis. Granulomatosis with polyangiitis. Bilateral nodules observed on a plain chest radiograph in a patient with hemoptysis and hematuria. Image courtesy of G. Eschun, MD. This 42-year-old man presented with hemoptysis, weight loss, and night sweats. He was diagnosed with the limited form of granulomatosis with polyangiitis. Bilateral cavitating nodules in a patient with granulomatosis with polyangiitis. Granulomatosis with polyangiitis. This patient presented with massive hemoptysis. No nodules are identified on the chest radiograph, although a subsequent CT scan showed several noncavitating nodules. Diffuse alveolar hemorrhage in a 21-year-old man with granulomatosis with polyangiitis. Image courtesy of the US Government. Shown is a chest radiograph of an 11-year-old girl who presented with an upper respiratory tract infection, myalgias, and arthralgias for 1 month, followed by an abrupt presentation with pallor, hemoptysis, and hypertension. Her bilateral fluffy infiltrates are suggestive of a pulmonary hemorrhage. She had an antineutrophil cytoplasmic autoantibody (ANCA)–positive pauci-immune necrotizing and crescentic glomerulonephritis associated with her pulmonary hemorrhage. Supportive therapy consisted of mechanical ventilation and hemodialysis along with immunosuppressive therapy. Her anti–glomerular basement membrane antibody test result was negative. Nearly 2 years later, she had a serum creatinine of 0.7mg/dL and no residual pulmonary disease. An 11-year-old girl presented with an upper respiratory tract infection, myalgias, and arthralgias for 1 month followed by an abrupt presentation with pallor, hemoptysis, and hypertension. She had an antineutrophil cytoplasmic autoantibody (ANCA)–positive pauci-immune necrotizing and crescentic glomerulonephritis associated with her pulmonary hemorrhage. A follow-up chest radiograph obtained several days later shows a complete resolution of her pulmonary infiltrates. This rapid resolution is more consistent with hemorrhage than with pneumonia. A renal biopsy specimen from a 13-year-old girl with antineutrophil cytoplasmic antibody (C-ANCA)–positive pulmonary renal syndrome. Seven weeks after presenting with sinusitis, she presented with an acute abdomen, pulmonary hemorrhage, and acute renal failure (creatinine 4.9mg/dL). This biopsy specimen shows a necrotizing and crescentic glomerulonephritis (Silver stain). Focal glomerulonephritis with crescent formation on renal biopsy specimen, characteristic of granulomatosis with polyangiitis. C-ANCA immunofluorescence pattern. Staining for antineutrophil cytoplasmic antibody by indirect immunofluorescence shows heavy cytoplasmic staining, whereas nuclei are nonreactive. Image courtesy of K. Orr, MD. P-ANCA immunofluorescence pattern. Perinuclear antineutrophil cytoplasmic antibody staining pattern by indirect immunofluorescence shows perinuclear staining, whereas cytoplasm is nonreactive. Image courtesy of K. Orr, MD. Goodpasture syndrome: Linear deposition of immunoglobulin G and C3 are observed on a renal biopsy specimen from a patient with Goodpasture syndrome. Immunofluorescence staining. Image courtesy of K. Orr, MD. The views expressed in this article are those of the authors and do not reflect the official policy of the Department of the Army, Department of Defense, or the US Government. Additionally, this publication does not imply the Federal or Department of Defense endorsement of any product.